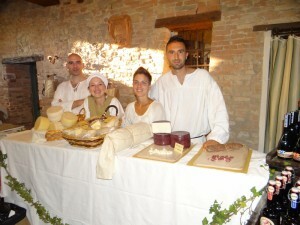 Mondaino has for years been one of the capitals in the production of Pecorino di Fossa. 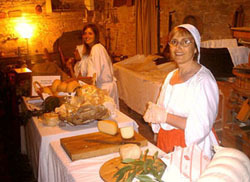 The protagonist of the event is the ancient artistic Mill of Porta di Sotto, where the pits dug in the Miocene sandstone, are they’re filled during the four days of Palio del Daino, in august, and emptied in the “Fossa, Tartufo e Cerere”time, in november, an event of typical autumn products. The Mill of Porta di Sotto employs a number of specialized agencies and many important experts of the dairy industry, catering and tourism. It was honored by the Emilia Romagna in the “Vetrina per lo sviluppo sostenibile” and has been awarned the De.Co denomination for the Malatestian Cheese pitted under the wheat. In addition it obtained the denomination of origin (D.O.C.) by the European Community. The Mill of Porta di Sotto, is a landmark of the largest local marketing agencies and one of the best italian gastronomic center. In 2010 it received the prestigious national award “Excellence Hospitality”, in the context of the great touristic mosaic. Our strong point is the traditional familiar setting in the business management. Our direct relationship with local institutions allows us to include dairy products within the typical ones of the history of Malatesta and Montefeltro, the history of Rimini and Urbino and the history of Romagna and Marche.